If you’re looking for a great place to watch the Big Game but would rather avoid crowded casinos or strange bars, awesome food and drink specials are just a short walk from your room at Tahiti Village. 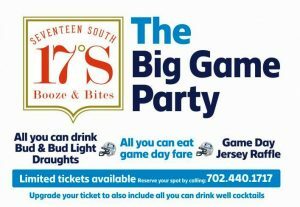 17˚ South Booze & Bites, our onsite bar and bistro, is offering all-you-can-eat appetizers and all-you-can drink Bud and Bud Light draughts. We have 10 widescreen screen televisions throughout the bar and restaurant. You won’t miss a minute of the action! No matter which team you’re rooting for, you’ll have a great time at 17˚ South Booze & Bites in the main lobby at Tahiti Village, Las Vegas’ family friendly, tropical resort paradise. Call 702.440.1717 to purchase advance tickets. Tickets will also be available at the door. Kickoff is 3:30 p.m., but be sure to arrive early to stake out a premium seat. Remember, one of the biggest decisions you ever make arrives every year with the Big Game. Your thorough enjoyment of the event depends utterly on where you watch the game. Remember, you don’t have the benefit of replay. There are no do-overs. You have a once-in-a-calendar-year chance to get it right. Get it wrong and, like a Russell Wilson goal-line INT to lose the biggest game of the year, your abysmal failure will haunt you the entire off-season and maybe the rest of your life. This is pressure. So be sure to join us at 17˚ South Booze & Bites, where you’re sure to have an all-you-can-eat and all-you-can-drink great time. As always, may all your prop bets come through! Plan a Las Vegas vacation in time for National Plan for Vacation Day!